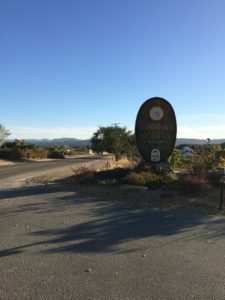 October 8, 2016 — A few weeks ago, our friend Larry mentioned that his cousin-in-law was playing guitar at Castoro Cellars and invited us to come. With that casual and unassuming invitation, we were introduced to the masterful musician and renowned fingerstyle guitarist Peppino D’Agostino. Visiting Castoro Cellars has been on my list for a long time, so I was really looking forward to the experience: a relaxing evening under the stars (and maybe catching some of the Draconids meteor showers), enjoying dinner from the food vendors, wine from Castoro Cellars’ Dam Fine Wine selection, talking with friends, and listening to great music. While there were some glitches in Castoro’s pre-concert operations – like the concert was held indoors in the gallery rather than outside — they were forgotten as soon as the house lights dimmed. Born in Sicily, Peppino D’Agostino began playing the guitar as a child and had a clear dream: to play with the great guitarists. He’s done that, and now he’s considered one of the great guitarists. 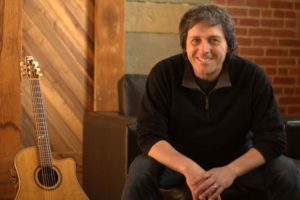 With a repertoire that ranges from old-world compositions to interpretations of modern-day songs, and representing music from all over the world, his playing is a sensory experience. In fact, for one song – “The Blue Ocean” – he had us close our eyes. Doing so allowed us to be with the ocean and hear its heart-reaching song instead of be distracted by visual input. Magical. D’Agostino lives in the Bay Area with his wife, and his grown daughter is away at college pursuing her dreams. We are fortunate he lives so close, and fortunate that SLO Folks brought him back to Castoro. Until last year, D’Agostino had played every year at Castoro for many years. He seemed glad to be back. 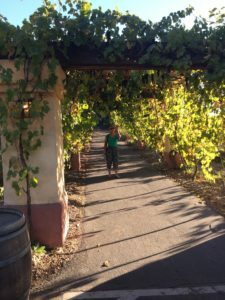 Grapevine covered walkway leads to Castoro Cellars. Castoro Cellars is a great place for a concert, but the organization did have some hiccups before the music started. Not stating anywhere that it was an indoor concert, we arrived early to get a good seat outdoors. When we asked where it would be held, we were told it was going to be indoors (being frigid California fall weather, after all), so there were no food vendors, and the tasting room was now closing and everyone would need to leave so they could “sweep the grounds” before reopening for the concert. Wow, we’re at a winery. Wineries are about selling wine and providing a wonderful place to enjoy their wine. We really wanted to buy a glass of wine and relax on the lovely grounds, but we… can’t? Shocked, we turned around and started to head down the grapevine covered walkway. Ah ha. We see a pair of friends having a delightful picnic at a table under the trellis, so we sat down and talked about Great Flavors business, while waiting to be “swept” off the premises. 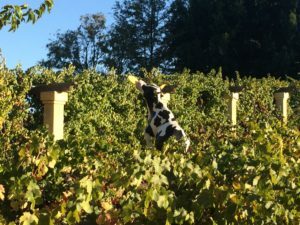 Frisbee-catching bovine frolicks among Castoro Cellars’ grapevines. Luckily, no brooms appeared, and finally they opened the tasting room. 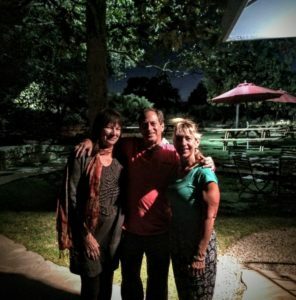 We bought a very nice bottle of 2014 Zinfusion and joined our friends at a stand-up table at the edge of the vineyard. With none of the food vendors mentioned in the New Times ad, we made our own picnic: two cheeses and flatbread from the tasting room provisions, and I’d brought Great Flavors Bakery gluten-free pumpkin cheesecake bites for dessert. Our impromptu picnic had all the elements for enjoying the great flavors of life: friends, food, drink, and good conversation.